In stock. Order in the next 9 hours, 56 minutes and it will go out today! What if you could perform the classic ACAN effect while you were STROLLING or HOPPING TABLES and succeed every single time without fail? What if the method was simple, surefire and took up no more pocket space than a single deck of cards? What if this powerhouse effect could be performed with NO MEMORY WORK, NO MATHS and NO SLEIGHT OF HAND? What if the spectator could genuinely name ANY CARD and they, themselves could deal the cards FACE UP to the randomly selected number? What if the deck was completely un-gimmicked - just fifty two regular playing cards - nothing more? What if the reset was instant and the effect could be repeated table after table, group after group? What if the entire effect took no more than a few minutes from start to finish and each performance left the group with TWO of your own business cards, altered in such a way as to ensure they'll be kept? Sound like a pipe dream? This is no pipe dream! This is David Forrest's AUTOBAHN! Included in this PDF is the complete routine from start to finish as well as the special artwork required to create the AUTOBAHN props. There's no craft or handy-work required, you won't have to 'make a gimmick' - simply print out the special AUTOBAHN artwork and attach it to your existing business cards. You won't believe how simple it is and you are provided with a lifetimes supply! 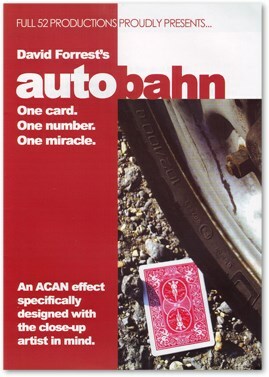 AUTOBAHN is a practical and workable solution to one of magic's greatest plots that will finally allow close up magicians to consistently and reliably unleash the awesome power of the ACAN effect on their unsuspecting audiences! Don't putter around in the side streets any longer. Take the next exit for the AUTOBAHN and STEP ON IT!